Android apps and reactive programming are a great match. This course will teach you how to chain network calls, handle user input and cache data, using RxJava and MVVM architecture. The most important elements of modern mobile apps are performance and data. Users want an app that is fast and responsive and they want their data to be fresh and accurate. 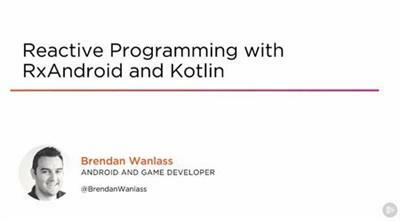 In Reactive Programming with RxAndroid and Kotlin, you'll learn how to deliver the kind of experience that the modern user demands. First, you'll discover why Reactive Programming is a great fit for Android development. Next, you'll explore how to take on Android's most pervasive challenges, such as composing network calls, caching data and handling user input. Finally, you'll see reactive programming and a solid architecture come together to provide an app that is extensible, testable, and performant. When you're finished with this course, you'll have a solid foundation in reactive programming with RxJava and will go from simply developing apps to architecting apps.